White Sand Beach resorts, hotels and bungalows have a good mix of accommodation, with two upscale resorts, several large mid-range spots, plenty of bungalows, the odd motel and a backpacker enclave. White Sand Beach itself is usually split into two halves, with a natural division at the point where the sandy beach, the northern end, gives way to the rocks and cliffs, the southern end. Practically, dividing up the beach also helps you and us get a handle on things, given the sheer number of hotels and rooms available, in what is the most developed and touristy area on Koh Chang. On this page , we start with our recommendations for the more popular northern end. KC Grande Resort and Kacha Resort are the pick of the upmarket White Sand Beach resorts at this northern end. After a major expansion program over recent years, KC Resort is right up there among the best hotels on the island, if not the best, offering 5 different swimming pools, luxurious accommodation on the beach, rooms by the pool and a modern 5 storey block on the opposite side of the road. Its standard deluxe rooms start at 3,500bt with the top of the range seaside villas at 11,900bt. Kacha Resort itself has not stood still and it too completely overhauled its seaside rooms in 2015-16. Prices range from 3,300bt to 8,800bt. Also now worth a look at this higher end, The Erawan Koh Chang offers 35 rooms from 5,000bt to 6,000bt with a great rooftop pool and well reviewed service. 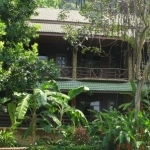 Cookies Hotel, Koh Chang Lagoon Resort and Alina Hotel stand up as three solid, 2/3 star White Sand Beach resorts. Their rooms are arranged either in two and three storey blocks on the beachside or on the mountainside of the road. Prices range from 3,000bt a night upwards. 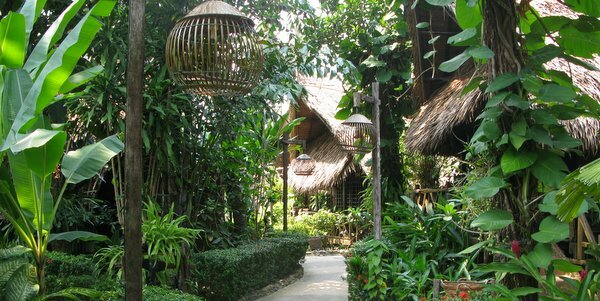 Banpu Resort has a much more natural feel to it, large elaborate thatch roofed bungalows in a tropical garden, little pathways connecting things together and a swimming pool by the sand. Their superior rooms are 3,500bt a night, bungalows at 4,800bt and family suites at 6,500bt. Deluxe beach, garden, suites and pool villas right by the sand, hillside room complex over 5 floors with rooftop swimming pool and 2 other pools, spa, restaurants, bars and all activities oganised. 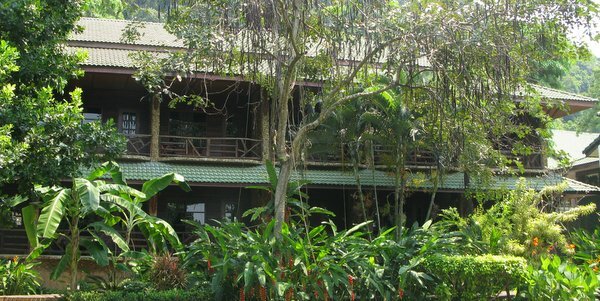 One of Koh Chang’s best luxury hotels. From standard rooms to deluxe pool villas located on both the seaside and the hillside. Swimming pool, children’s pool, restaurants and spa. Hotel at the northern end built into the hillside, 3 minutes from the beach. With 35 rooms over 3 floors, accommodation comprises standard, mountain view, seaview and family rooms, suites too, all with balconies. Rooftop swimming pool. Restaurant, cocktail bar. Seaview rooms and bungalows, all a/c and amenities, designed with wood and thatch, swimming pool, pretty gardens and restaurant. Something a little different from the other hotels and resorts in the mid-range. Also on the seafront and increasingly popular with the Chinese market, Du Talay Hotel is a stylish small 3 star boutique offering whose brushed concrete rooms start at 2,450bt for a superior double rising to 5,175bt for its deluxe seaview room with spa bath. Places such as SP Place, Buffalo Bill Hotel and Baan Sai Khao, up by the road, offer yet another option with good value, clean rooms in a more motel-style setting. Prices start at 1,500bt for a double. At the very end of the beach, indeed it actually has its own precariously steep street leading off the mountain for car access, sits White Sand Beach Resort, bungalows at reasonable rates, 1,900bt to 3,000bt, on the sand, a good dark-horse choice. At the far northern end, accessed by a steep road as you cross the mountain or by walking to the very end of the beach. 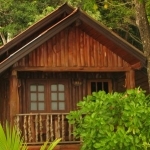 Bungalows in different styles, family rooms and suites. all laid out just off the sand. Restaurant and activities. Offering 12 rooms, a/c, tv, bathroom in a two storey hotel style building by the road, with restaurant for breakfast, lunch and dinner, coffee and cocktails on the front. Across the road to the beach. Well appointed superior and deluxe a/c rooms on several floors off an airy central atrium. Front desk service but no restaurant. In the heart of the action of the hotels and restaurants but two minutes to the beach. Small 2/3 star resort with swimming pool. 36 a/c rooms, bathrooms, superior and standard, pool views or seaviews. Bar and restaurant area overlooking the sea, with the beach on the doorstep. Wifi. Next door to Bamboo Resort, another small resort with swimming pool. 50 a/c rooms in different configurations, by the pool and with seaviews. Restaurant, bar on the beach. Wifi. Boutique style hotel at the end of the sandy part of the beach by the beach walkway. Just 21 rooms over 3 floors, with deluxe jacuzzi specials at the front complete with terrific views over the ocean. Brushed concrete, light and airy rooms finished to high standard. Breakast terrace and restaurant by the beach. Popular with Chinese market. An historical hangover from the early days of Koh Chang, when longboats used to deliver travellers to this beach, the backpacker quarter is right on the sand at the northern end, just a little on from KC Grande. Each has rooms built into the cliff-face with cheap (400bt+), fan, shared bathrooms at Pen’s Bungalows, Little Chang and Starbeach, an eclectic atmosphere at Bo Independent, chilled out at Malyamean and a more salubrious, expensive range at Rock Sand Resort. At high tide, the sea does encroach a fair bit, so you might get wet walking back and forth from the action on the main street, but it’s a great ongoing alternative to the larger resorts elsewhere. You will also find a few cheap and peaceful White Sand Beach guesthouses from 700bt a night along a little street that runs inland next to Kacha Resort, Island Lodge, Tuk Tuk Guesthouse and Fisherman Hill Resort being the pick of the bunch. 12 simple fan bungalows built against the cliff in the backpacker area, some with shared bathroom and cold water, some with their own bathroom and hot water. Nice hang-out restaurant high up on stilts. Perhaps the grandest of the budget accommodation and hotels at this end of the beach, fan and a/c rooms, singles, doubles, family room and busy popular restaurant. A short walk from the road to get there, trickier at high tide. Long established backpacker haunt with fan bungalows built into the rockface and an artist inspired hang-out restaurant with a lively evening bar. No children and 3 night minimum stay. Walk in only. Long established operation down the inland street by Kacha. Fan and a/c rooms, cabins and family suites in different buildings around the garden. Restaurant. Just a few minutes from the water. White Sand Beach, north or south, has far too many options to list in full, so here is a selection only to go with our recommendations above. Variety of standard and deluxe rooms by the sea, pool or in the three storey complex on the other side of the road. Swimming pool. Popular restaurant at Sea and Soul. Very mixed reviews among the Koh Chang hotels. Older style hotel with standard, superior, deluxe rooms or villas by the sea and in the complex on the opposite side of the road known as the White Sands Princess. Restaurant and one of the better beachfront bbqs. Hotel by the sea with separate building on the other side of the road, offering a selection of a/c bungalows, single and twin rooms. Swimming pool, restaurant and beach bar. Up the small soi by Kacha, fan and a/c standard rooms with family suites and good restaurant. A few minutes only to the sand, practical though definitely not a resort. One of several smaller resorts on this stretch of the beach near to Bamboo and Apple Beachfront. 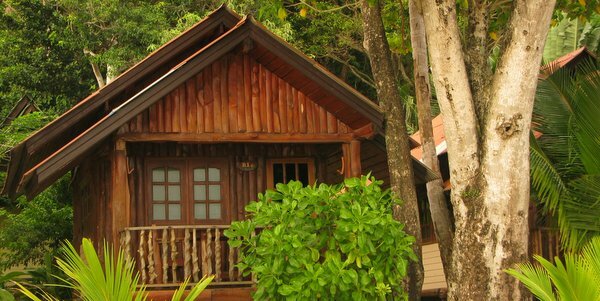 Lanna style a/c bungalows and rooms. Popular bar and restaurant on the sand. An old favourite.